As the equity market gyrates, the website team finds it’s necessary to talk about some measures that investors may take to have the advantage of the movements in equity prices. Investment in equity requires a basic knowledge of finance and continuous tracking of the in the companies invested. The mistake common to all passive investors ( who invests in fixed deposits or debt funds or FMPs) especially with little knowledge of finance takes the form of borrowing tips from friends, relatives and seeking free advices from brokering houses. The end result seems to be loosing of money and even valuable goodnight sleep. The alternative method is entering mutual funds to invest in the stock market and is better suited for passive investors. The investor gets the benefit of the highly researched efforts of the fund house through investing in Mutual Funds. The popular concept of regular savings lies in the systematic investment plan. Systematic investment is an investment vehicle. It is offered by mutual funds as a vehicle to save the income on a regular basis. It is just like a recurring deposit with banks or post office where an investor saves on a regular basis. The difference between the recurring deposit and the Systematic Investment Plan (SIP) is that money in SIP is invested in a mutual fund. 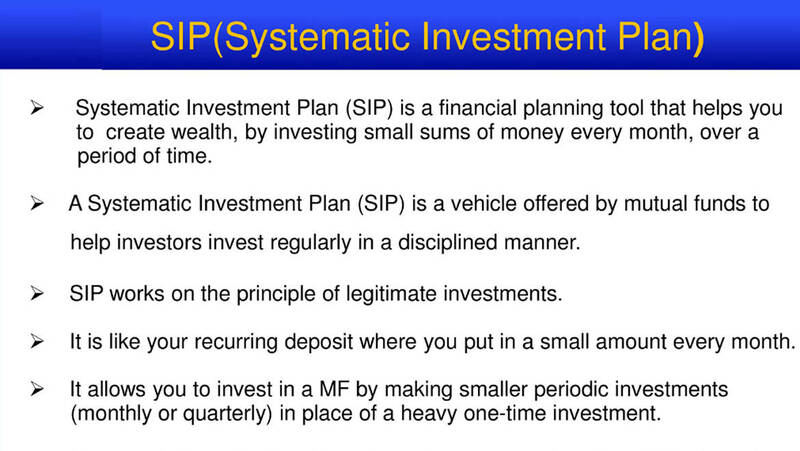 The SIP has become a popular option due to some proven facts. Through SIP, small periodical savings in a mutual fund ends up to become big chunk of money over a period of time. SIP helps you to be disciplined in terms of savings. Once an investor starts a SIP, he becomes committed to be there for a particular period of time. With this disciplined manner, the investor enjoys the benefits of compounding. Another advantage of SIP is that an investor does not require to time the market. The biggest problem in the equity market is to know when is the right time to invest or to exit. SIP actually helps you to solve the timing issue to enter and exit the market. SIP is disciplined investing irrespective of the state of the market. If the market is high, then it will buy fewer units as the NAV (net asset Value) will be on the higher side and vice versa. So if the horizon is two – three years, then market timing will become irrelevant as market will see ups and downs throughout this time horizon and the index and its constituents average out in value for investments. SIP also allows investing in small amounts, as low as Rs.500. So even for small investors they can invest and that will not pressurize them financially. SIP also helps in terms of rupee cost averaging. In a SIP, an investor puts money on a regular basis. Therefore, he ends up buying more number of units when the markets are down and NAV is low and less number of units when the markets are up and the NAV is high. This is called rupee-cost averaging or purchase cost averaging. SIP works in such a discipline manner that it helps to buy even when markets are low and avail the advantage of rupee cost averaging. Here is an example how SIP has made the difference in terms of making money by selecting a good fund. Suppose, Person A has put Rs.1000 per month in each of the four different funds through SIP, the start date is the date of inception of the fund and end date is May 2011. Now if we compare at the two tables, we find that first table has given an overall gain of 1473.11% where as the second table shows a gain of 65.78%. So we clearly understand that longer you stay invested in a SIP the better is the return which can also fetch you exponential return. The fair conclusion seems that if an investor follows discipline and stays invested for a long period, he needs not to time the market and can have better return rather exponential returns.